There’s nothing quite like a moving melody or upbeat song to illustrate what words can’t — the connection and beauty of two people in love. With lively colors and a unique style, this Ketubah captures the classic style and emotion of jazz music. The swirling instruments and musical instruments give movement and life to this beautiful design. The checkered purple and blue background gives depth and color, creating the perfect space for the Ketubah text. 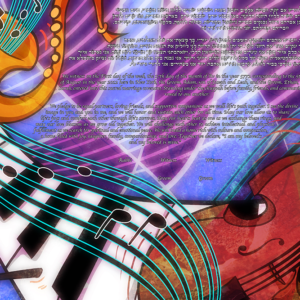 The All that Jazz Ketubah is perfect for the couple that considers themselves passionate music lovers! Whether you spend weekend afternoons putting on your favorite albums or play instruments yourselves, this Ketubah will capture the beauty and life music brings to your relationship. This work of art will be a touching symbol of your love for one another — a beautiful song that will continue on forever!